i can't even believe i'm typing this... but my computer is still throwing up the blue screen! i guess i'm going to have to take it somewhere... but i can't imagine what else they can do, since i did a total reformat. yikes! 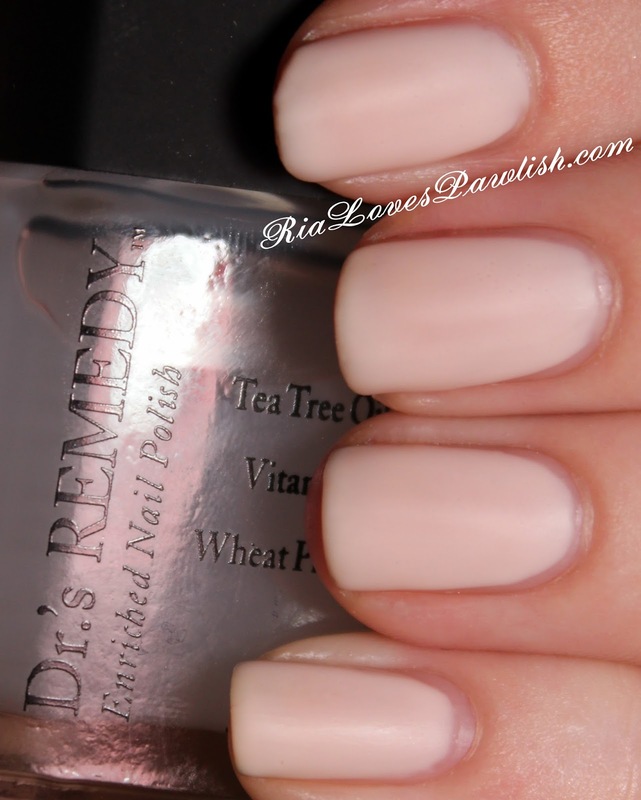 today i have Dr.'s Remedy Modest Matte Topcoat to share! i have swatches of it over Dr.'s Remedy Loyal Linen and Dr.'s Remedy Promising Pink... and both are over Dr.'s Remedy Basic Basecoat (all four are press samples, kindly provided to me for review!). first up, here's Modest Matte over Loyal Linen! Dr.'s Remedy nail products include great ingredients such as Tea Tree Oil, vitamins, and wheat proteins and are free of formaldehyde, formaldehyde resin, toluene, camphor, parabens, xylene, and dibutyl phthalate :) they are also touted to be the #1 recommended brand by podiatrists!